Q: I've got nine courses laid and two or three more courses to go on my garden wall, and am looking for plastering options for my poly bags. I'd like to put a Type S hydrated lime plaster on, but from what I've read I'm not sure that this would adhere directly to the bags. They suggest an earthen plaster undercoat, but I don't really want to do that as I'm not sure my clay is the right type. (It dries to rock-hard state in the summer heat and has lots of shale in it which would be difficult to winnow out.) Do you think I could slap it directly on the bags? A: My experience with lime plaster is that it works best in thin applications, partly because it takes a long time to dry, but also because it does shrink quite a bit. Like clay, it needs to be mixed with sand for greater durability and less shrinkage. I used a lime plaster over papercrete on the interior of my earthbag house, and this worked well. In your situation I might suggest an earthen plaster first, and then a thinner coat of the lime. A bit of latex paint can be mixed with this to keep it from rubbing off when touched. I am sure that your clay will work fine if it is mixed with 2 or three parts of sand for every part of clay. I was working with a lime putty that I had prepared in advance and then added white sand and a tad of white Portland cement to make it set up quicker. It can take quite awhile to harden, especially in a humid environment. In Mexico, I tried mixing straight hydrated lime with sand in ratios simillar to cement stucco, and applied this as the complete plaster on the inside of the little dome project. This was during the dry season, and it hardened up within a few days and seemed to be quite durable, without much cracking...I was impressed. Q: We're planning on plastering the building with lime and lime-wash. I know that this must hold up pretty well in the tropics because all of the old Spanish forts in old San Juan had lime mortars and plasters. But I want to know how often will we have to apply a lime wash to keep the plaster fresh. A: I think that lime washes are often renewed every few years to keep them fresh looking and help protect the plaster. A: Lime plaster is often used to provide a somewhat weather resistant coating over traditional cob or earthen plastered buildings. These walls, however, are usually also protected by roof eaves and do need to be renewed periodically. Lime plaster is fairly soft and is not waterproof, which is often a good thing in that it preserves the breathability of the wall system. Providing an adequate moisture barrier on an earthbag dome is something that needs careful attention. Even conventional cement-based stucco cannot be relied upon to provide long term assurance that leaks won't occur. I have used latex-based roof coatings over stucco in an attempt to waterproof a dome, but this is neither natural nor permanent. 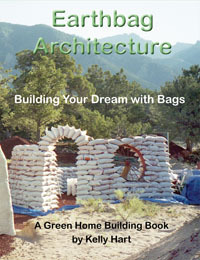 The earthbag/superadobe community is still looking for the perfect solution to waterproofing domes. Please let us know if you find a good solution! Q: I was wondering if a limestone plaster or stucco on the outside would work or be durable? A: Yes you can use a limestone plaster on the exterior and this would especially be a good choice if you are making a vertical wall home as opposed to a dome. Lime may not provide the needed moisture protection if there is not a roof with an eave over the building. Q: Would cement augmented lime plaster still be the covering of choice for scoria earthbags in CO? That or conventional stucco? A: I used cement augmented lime plaster, over an initial application of papercrete, on the interior of the earthbag dome house that I built in CO. It is breathable and fairly durable, but would still absorb some moisture. On the exterior of that house I first left the papercrete (which absorbs a great deal of moisture), but then the house was given a conventional stucco application for greater durability, and this is much more waterproof. The more I read the more inclined I am toward vertical walls w/ lot of overhang from roof. That is the safer way to go, and then you definitely can used a lime or lime stabilized earthen plaster on the exterior and it will be breathable enough.